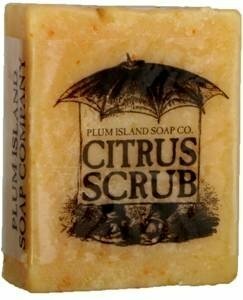 Citrus Scrub - Scented with pink grapefruit lemon and orange essential oils for a wonderful citrus blend. Addedecornmeal gives a gentle exfoliation. Our handmade Soaps are made in small batches in our little factory on Plum Island with high quality vegetable-based ingredients. We use only the finest pure essential oils for scent and natural ingredients for properties and texture. All our bars are creamy in lather pure gentle and wonderfully scented! Available in 8 flavors. Each bar weighs 3.5 oz.